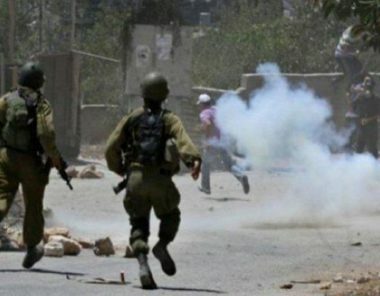 Israeli soldiers invaded, Sunday, the town of Sebastia, north of the northern West Bank city of Nablus, and caused dozens of schoolchildren to suffer the effects of teargas inhalation. Mohammad Azem, the Mayor of Sebastia, said the soldiers invaded the Schools Street in the town, and fired many gas bombs at the students who were heading to their education facilities. Azem added that dozens of children suffered the effects of teargas inhalation, and received the needed treatment. It is worth mentioning that the soldiers repeatedly invade the town, especially while the students are heading to school or returning to their homes, an issue which caused tension and protests. In related news, the soldiers abducted a Palestinian Shepherd in Ein al-Hilwa area, in the Northern Plains of the occupied West Bank. On Sunday morning, the soldiers abducted three Palestinian children from their homes in Jerusalem and Hebron, in the occupied West Bank. Israeli occupation forces closed, on Sunday, the entrance to the village of Deir Abu Meshal, to the northwest of Ramallah, occupied West Bank, said local sources. Deputy mayor of the village, Fawwaz Bargouti, told WAFA that Israeli soldiers shut down the metal gate at the main entrance of the village, which forced local citizens and passengers to use alternative, longer roads to reach to their workplace. Israeli occupation forces recently imposed restrictions on the movement of Palestinians across the occupied West Bank, in a collective punishment for the fatal shooting of three Israeli soldiers near Ramallah, earlier this month. The Israeli Magistrate Court in Haifa yesterday ordered the head of the Islamic Movement in Israel, Sheikh Raed Salah, to be placed under house arrest at his home in Umm Al-Fahm after he spent six months under house arrest in Kafr Kanna, Arab48 reported. Salah was released by jail in July on condition he not be allowed to return to his home town of Umm Al-Fahm after he served one year in prison. He was also banned from accessing tools of communication including telephones, the internet and social media sites. The court looked into an appeal filed by his defence team and accepted it, allowing him to return to his home. “Fixing the conditions imposed on the Sheikh is an arbitrary act by the Israeli court and it included massive oppression,” Zabarqa said. Sheikh Salah was arrested from his house on 25 August 2017 and was indicted nine days later by the Israeli Public Prosecution. He was accused of 12 charges, including violating the law and inciting terror. A Palestinian court today sentenced an American-Palestinian to life imprisonment for violating a ban on selling land to Israelis, judiciary officials said. The US Ambassador to Israel, David Friedman, called in November for dual national Issam Aqel to be released, saying his suspected crime was “selling land to a Jew” and his incarceration violated American values. Aqel was accused of attempting to sell a property in Israeli-occupied East Jerusalem without the permission of his business partners or Palestinian authorities. Palestinian officials have not publicly identified the intended buyer. The Higher Offences Court in Ramallah, in the occupied West Bank, convicted Aqel of “attempting to sever parts of Palestinian land and annex it to a foreign state,” the judiciary media office said. “In light of the conviction, the court handed down a life sentence with hard labour,” it said. Aqel can appeal, a judiciary official said. Aqel’s family, which denied the allegations against him, said it was unaware of the verdict or sentence. Aqel was detained on 10 October in Ramallah, an Israeli security official said. Palestinian law bars selling land to “a hostile state or any of its citizens”. It requires the permission of the Palestinian Authority for all land sales in East Jerusalem. Israel captured the eastern part of Jerusalem in the 1967 Middle East war and annexed it in contravention of international law. A new report has found that the percentage of Palestinian citizens of Israel living below the poverty line is almost double the national average, pointing to a huge disparity between Palestinian and Jewish Israelis. The report – released today by Israel’s National Insurance Institute (Bituach Leumi) – found that 47.1 per cent of Palestinian-Israeli families live below the poverty line, versus a national average of 28.4 per cent. The findings are based on data gathered by Israel’s Central Bureau of Statistics for 2017 which, according to the Jerusalem Post, is “the most recent year for which comprehensive information is available”. Although the poverty rate among Palestinian citizens of Israel fell from 49.2 per cent in 2016, the figures still indicate that almost half of all Palestinian families living in Israel live in poverty. Other minority communities were also shown to be suffering higher-than-average poverty rates, including Israel’s ultra-Orthodox community. Today’s report shows that 43.1 of ultra-Orthodox families live in poverty, only marginally less than Palestinian citizens of Israel. According to the report, Israel has the highest poverty rate of any country in the OECD (Organisation for Economic Co-operation and Development). The high poverty levels experienced by Palestinian families stems largely from the discriminatory policies Israel pursues against them in terms of resource allocation, building permits and, in the case of the country’s Bedouin community, punitive house demolitions. The Legal Centre for Arab Minority Rights in Israel – better known as Adalah – keeps a Discriminatory Laws Database of all the legal mechanisms that discriminate directly or indirectly against Palestinian citizens of Israel; amounting to over 65 Israeli laws in total. In terms of contributing to poverty, Adalah cites the 2015 “Amendment No. 163 to the National Insurance Act” which revokes child allowances from parents of children convicted of security offenses. Adalah explains that the law specifically “targets Palestinian minors who are either citizens of Israel or residents of East Jerusalem, and who are all brought before Israeli civil courts”. Another example is the 2009 “Economic Efficiency Law,” which “extends government permission to use sweeping discretion to classify towns, villages and areas as ‘National Priority Areas’ (NPAs) and to allocate enormous state resources without criteria”. In the past Israel classified 553 Jewish towns and only four small Palestinian villages as NPAs, allowing swathes of government funding to be allocated to Jewish areas of Israel. Palestinian citizens of Israel – sometimes known as ‘48 Palestinians – represent 20.9 per cent of Israel’s 8.9 million strong population. During the Nakba of 1948 they were among 750,000 Palestinians forcibly displaced by Jewish militias, with many now living only a few miles from their ancestral village as internally displaced persons. Gaza’s economic losses exceeded $300 million in 2018 as a result of Israel’s stifling siege on the Strip, head of the Popular Committee Against the Siege Jamal Al-Khodari said yesterday. In a statement, a copy of which sent to MEMO, Al-Khodari described 2018 as “the most disastrous year” for Gaza since it was occupied by the Israeli occupation in 1967. “Gaza experiences unprecedented disastrous economic situation […] due to the 12-year strict Israeli siege and the three destructie Israeli offensives,” Al-Khodari said in the statement. “The continuous and systematic Israeli siege aimed to hurt the national economy,” he said. According to Al-Khodari, the Israeli occupation is still banning hundreds of basic commodities from entering Gaza, causing up to 90 per cent of Gaza’s factories to stop working. He stated that there are around 300,000 unemployed workers in Gaza, in addition to tens of thousands of unemployed university graduates. “The unemployment rate in Gaza is over 65 per cent,” he said. “Income of more than 85 per cent of Gaza residents has declined to less than $2 a day,” he said in the statement. He called for the international bodies and the international community to put pressure on the Israeli occupation in order to meet its obligations under the Geneva Convention and the Global Declaration of Human Rights, which criminalise the siege and collective punishment.